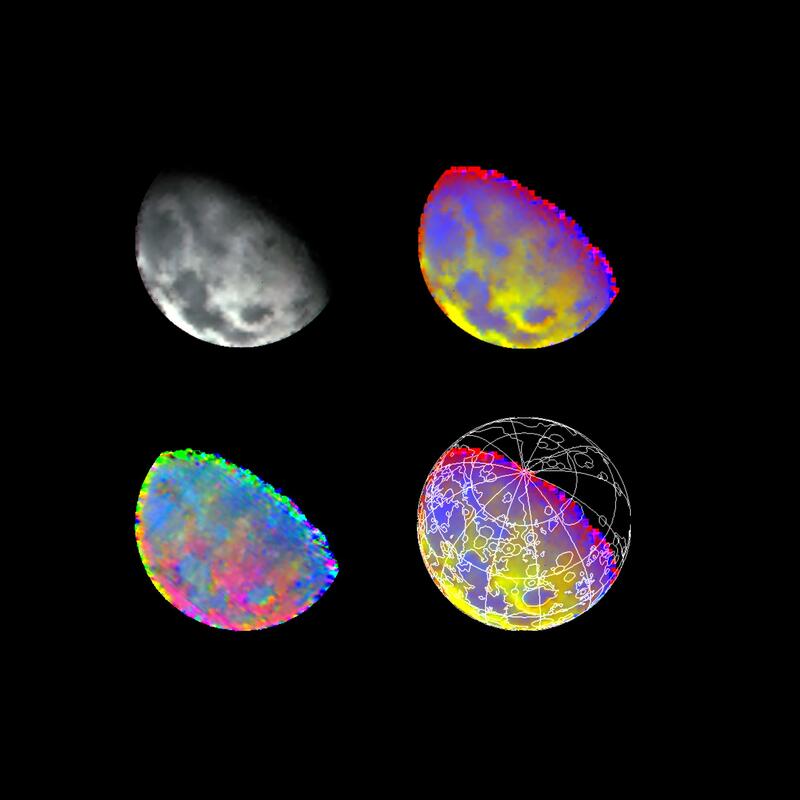 These four images of the Moon are from data acquired by the Galileo spacecraft's Near-Earth Mapping Spectrometer during Galileo's December 1992 Earth/Moon flyby. 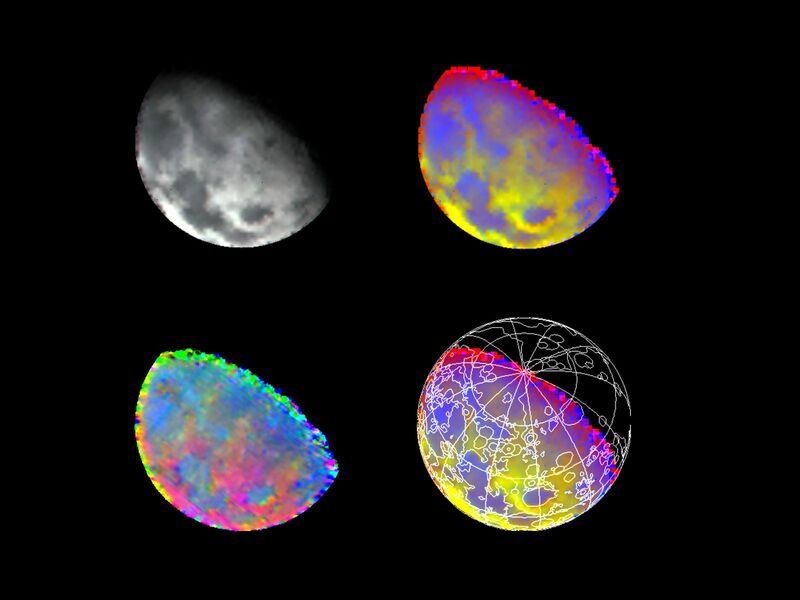 The part of the Moon visible from Earth is toward the left, and the lunar north pole is near the terminator, upper right. The dark regions to left and below in the black-and-white image at upper left, are lunar Maria, including Mare Imbrium at upper left, Serenitatis and Tranquillitatis, lower left center, and the circular basin to the right is Crisium. 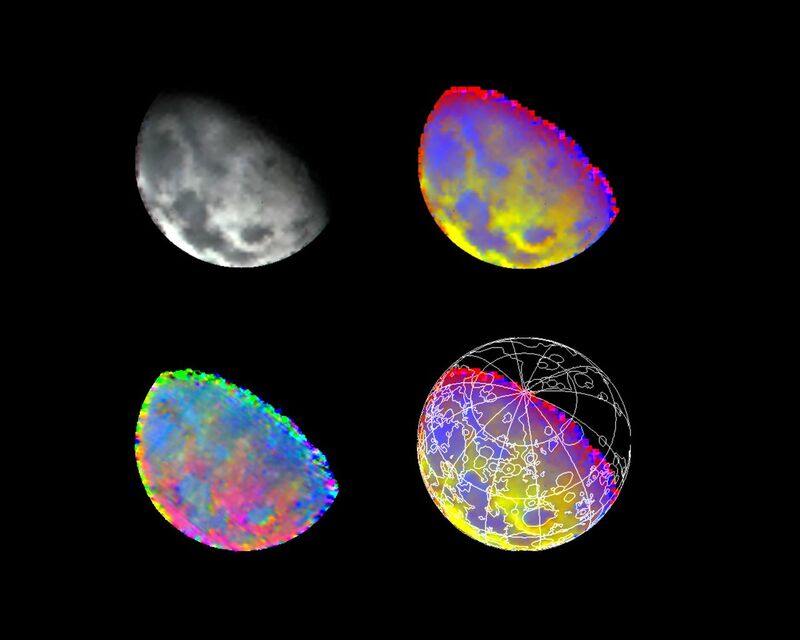 The bright areas ringing Crisium and dominating the center of the images are the heavily cratered and mountainous lunar highlands. The black-and-white image used infrared wavelengths just beyond the visible deep red. 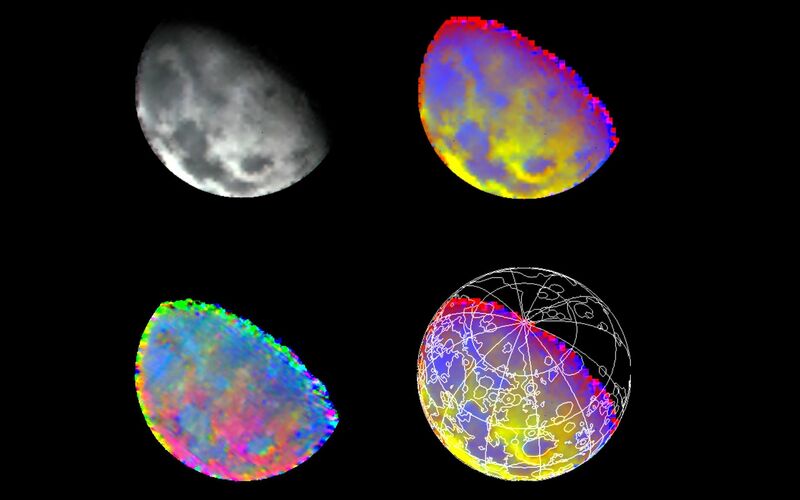 The false-color map images (upper right and lower right) show the relative strength of silicate-rock absorption of near-infrared sunlight, at about 1-micron wavelength. Blue areas show stronger absorption and generally indicate materials with more pyroxene and olivine (iron-bearing silicate materials), while yellow indicates less absorption, due to original compositional variations. In young fresh craters, absorptions are also stronger due to the absence of meteorite-impact effects. Outlines of previously defined geological units are superimposed in the lower right image. Note correlation with the Maria/highlands features in the black-and-white image. The preliminary mineralogical map at lower left uses infrared band shape and intensity to visualize variations in pyroxene and olivine. Blue is related to low-calcium pyroxene, while green and red indicate high calcium and the iron/magnesium content of pyroxene, as well as olivine. The Galileo project, whose primary mission is the exploration of the Jupiter system in 1995-97, is managed for NASA's Office of Space Science and Applications by the Jet Propulsion Laboratory.